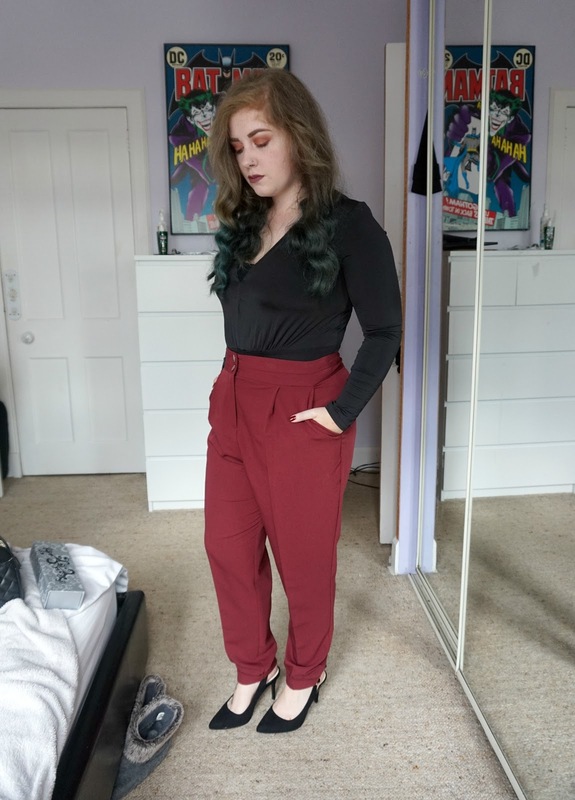 I actually posted this outfit (with a terrible phone camera photo) onto Twitter back when I wore it, but I absolutely loved it so I thought I'd take camera photos before heading out to share with you at some point on the blog. Today is that day! I threw this look together not fully knowing what I was going to wear when I took my mum out for her birthday meal at Miller & Carter, the steakhouse chain that recently opened up in the city centre. Heels wasn't an overly practical choice because I knew with Jack being away that we would be getting the bus there and hopefully a taxi back, and we'd maybe even go to another bar later in the night (which is what we did), but these shoes are actually the black version of the ones I wore to the wedding with J last year, and they're from the New Look comfort range. Whilst I put gel insoles into my pink ones, it turns out that I don't really need them. The thing that gets uncomfortable about these shoes is the pointed shape which tends to squish my toes together - it's a shame as they are otherwise not too bad to wear. The balls of my feet did start to ache a bit at the end of the night so I do see a benefit in gel insoles, but still, they're not too shabby and I don't feel the need to rush out and spend £10-£12 on insoles. I don't actually get enough wear out of these trousers, the high waist berry ones I bought from ASOS in January. In all honesty they could do with having the hem taken up a little (even though they've already been taken up once), as they're still longer than my black pair, but these are a not bad length to be wearing with heels, and for this reason I prefer them as a dressier piece than wearing them casual, which is something I often do with the black pair I own. For my top I opted for a bodysuit I've actually never worn. I picked it up in the sale quite a few months ago, but it looks fab on. I love a low neck as I think they are really flattering on me, but despite having had my mum sew up the neck a little already, I still wore a short bandeau top underneath - more so my outfit was a little more appropriate for a meal with my mother. I wouldn't have minded going without if I was going out with Jack. I didn't do much for accessories, I just wore some rings (all from New Look's Sterling Silver range bar the plain silver band underneath the large grey stone ring which was part of an Accessorize set, and the thumb ring which is from my mum) and a pair of plain, circular earrings (which I forgot to photograph), and I tossed my black faux leather jacket on over the top to toughen up the outfit and give it a bit of edge. I think this would look mega grown-up with a boyfriend jacket on top, I really don't get enough wear out of mine and it's outfits like this that I think it was made for! I can't remember why I didn't wear the boyf jacket, I think I just forgot about it. I tend to forget in general as it's too long to hang up in my wardrobe or cupboard, so it lives in the hall cupboard. If anyone is wondering about my nails, I'm wearing Maybelline Superstay 7 Day Gel Nail Polish in Midnight Red with Barry M Molten Metals in Holographic Lights. As for my make-up, I used the BH Cosmetics Foil Eyes Palette, Jeffree Star Velour Liquid Lipstick in Androgyny and Kat Von D's Metal Crush eyeshadow in Thunderstruck for my highlight. I do love to dress up and pretend I'm a bit more sophisticated than I probably really am, but I don't have the chance all that often. What do you think of my outfit choice?